I think that May is one of my favourite months, being a Stampin’ Up! demonstrator! This is the month that we get to see the new Annual catalogue – a whole month before anyone else! – and we get to preorder stamp sets, inks, tools, papers, cardstock and embellishments, so that we have a chance to play, and make projects to give you ideas of how awesome they are! This month’s blog hop is to do just that; give you a sneak peek at some of the new products, and how we’ve used them. Also, we’re saying goodbye to some of our favourite retiring products, and since Father’s Day is just around the corner, sharing some ideas for some Dad cards and gifts. To enjoy the blog hop is very simple; our posts are linked to the one before and after, so all you have to do is keep clicking in one direction, and you’ll be taken through all the participating posts. If the technical gremlins get in the way, you can always click on the ‘home’ button, where you’ll find the complete list of participating blogs, and the direct links to each one. If you’re starting at the beginning – welcome! I am at the top of the list this time, so I’d like to give you a warm welcome, and I hope that you find much enjoyment and inspiration! 🙂 If you’ve started somewhere else, you may be arriving from either Marsha Reed’s incredible projects, or from Marie Green (have you had time to put your socks back on, because I’m sure they were knocked off!). Not only did I use a retiring stamp set, but I also used almost all of the retiring In Colours, as well! Seriously, I just can’t give up this stamp set yet; it’s been a mainstay of my stamping arsenal, and I won’t part with it until I can find a suitable replacement. I’m sure I will, eventually. I started with a panel of Whisper White cardstock, and I used my Sponges and inked, from bottom to top: Mossy Meadow, Lost Lagoon, Hello Honey and Tangelo Twist. I took my colour inspiration from looking out my kitchen window every evening; we get some gorgeous sunsets, and I see them through the leaves of the trees, just like on my card. The tree silhouettes was stamped in Memento Black ink, after I finished the sponging. The sentiment is taken from another retiring set (that I haven’t used nearly enough) called Beautiful Ride, from the Occasions Catalogue. I stamped it in Tangelo Twist ink onto Whisper White, then backed it with a strip of Tangelo Twist cardstock. Behind my stamped panel, I added a piece of Tangelo Twist cardstock that I had first die cut using the retiring Floral Frames Collection Framelits, which I then ran through the Big Shot with the Gently Falling Embossing Folder. I attached this to a panel of Hello Honey cardstock that I embossed using the retiring World Traveler Embossing Folder (something else that will be staying in my stash). I lightly sponged over the embossed areas with the Tangelo Twist Sponge Dauber, for a little extra depth. This was then attached to my card base of Tangelo Twist cardstock. I started with a card base of the Thick Whisper White cardstock, and added a panel of Basic Black. Next I used the Banners Framelits to die cut one from Whisper White cardstock, and one from the Going Places DSP stack. 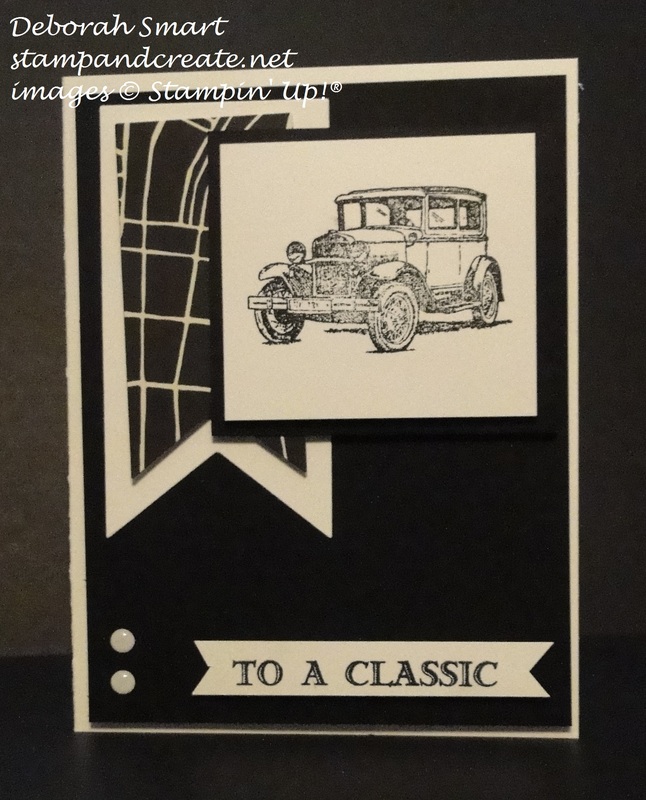 Then I cut 2 pieces of cardstock in Basic Black and Whisper White, and stamped the classic car image on to the Whisper White in Archival Black ink. The sentiment was stamped in – you guessed it – Archival Black ink onto Whisper White; I just used my Snips to cut the banner tails. Isn’t this fun?! This set has a total of 9 stamps, and I think the ideas are endless! I started with a card base in the new Emerald Envy cardstock, then added a panel of Blushing Bride cardstock. I added some Sweet Sugarplum ink spots across the Blushing Bride, then added a strip of Playful Palette Designer Series Paper across the middle. I stamped the frame and easel on scrap Whisper White cardstock, and cut them out using the Squares Collection Framelits (frame) and my Paper Snips (easel). To the frame, I stamped the paint brush strokes in two new In Colours, Peekaboo Peach and Flirty Flamingo, then added the sentiment on top in Emerald Envy ink. 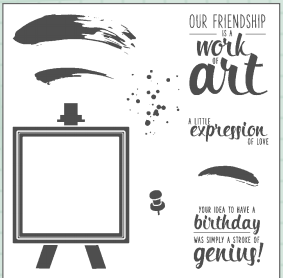 I assembled the frame and easel with Stampin’ Dimensionals onto the middle of the card, and I was done! I think this makes a quick & cute card, that is easily duplicated if you need lots in a short amount of time. As I said, I am looking forward to playing a lot more with this set; I’ll be showing off more samples at my upcoming New Catalogue Kick Off Party at the end of this month. Well, that’s it for my projects; if you have time to leave a comment, I’d love to hear what you think! Then, you’ll want to click on the ‘Next’ button to see what amazing projects Marsha Reed has for you, or click the ‘Previous’ button if you’re travelling backwards, and want to see Marie Green’s projects. Either direction, I guarantee you’ll be happy! Thanks for joining us for this month’s May Mashup blog hop! Until next time – happy stamping! What a great assortment of projects, Deb! I have to admit that my favourite is the first one and that’s because, like you, I mourn the retirement of the Serene Silhouettes set. You’ve certainly given it a wonderful send-off with that gorgeous card. Love your Father’s Day card. Keeping it clean and simple really gives it impact. And I also love the way you’ve used that brand new stamp set and the new In-Colors for your last project. Thanks so much for being part of our awesome Wacky Watercooler blog hop! 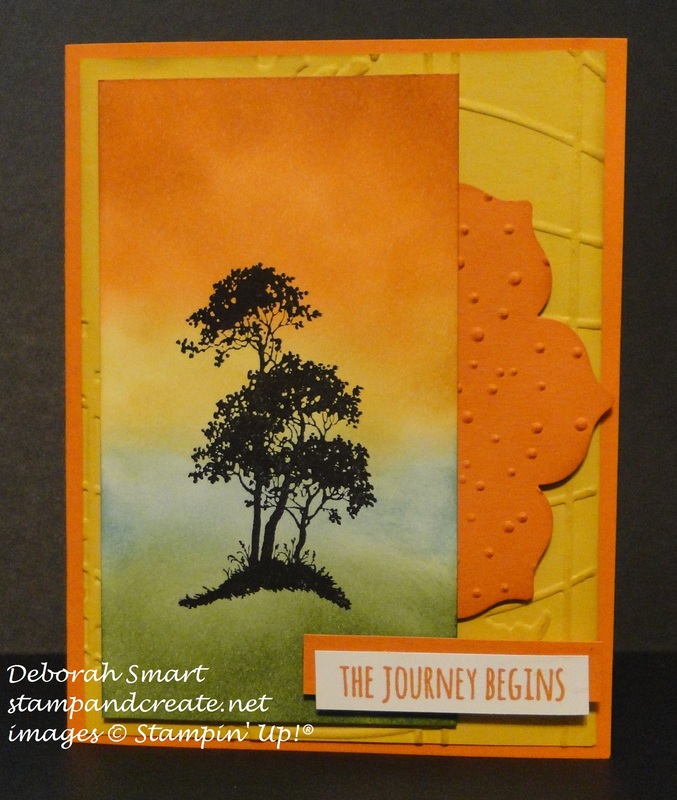 Deb, you must see some awesome sets based on your Serene Silhouettes card – it’s beautiful! Your Father’s Day card is so crisp and “classic”! Really do love it! And last, but not least, your Painter’s Palette card is just too fun! Thanks for sharing your talent with us! I’m glad you caught the ‘classic’ joke on my guy card, Marie! I couldn’t resist using that sentiment, with the ‘classic’ black & white. 🙂 Thanks for your kind comments on my cards – I’m glad you enjoyed them! Wow, talk about blown away. That beautiful explosion of colour in your first card totally had me, but then you used one of my all time favourites Serene Silhouettes, and I was smitten! Like you I’m not going to sell off this set. You cant’ beat black and white, and you’ve really demonstrated that with your Father’s Day card. It’s a true classic, a clean and simple card and one I think I’ll CASE. I’m also a big fan of your Painted Pallette card. Great mixture of new colours and design. Thanks so much for sharing your wonderful narrative and beautiful projects. Penny, I’m so glad to read that you’ve enjoyed seeing my cards! I’m glad you will also be keeping your Serene Silhouettes stamp set 🙂 Thanks for your lovely comments, my friend! What a fun line up of creativity, Deb! I’ll start at the end–I’m enjoying Painter’s Palette and love what you did with this card! And your Guy Greetings card is perfect for a “guy”! 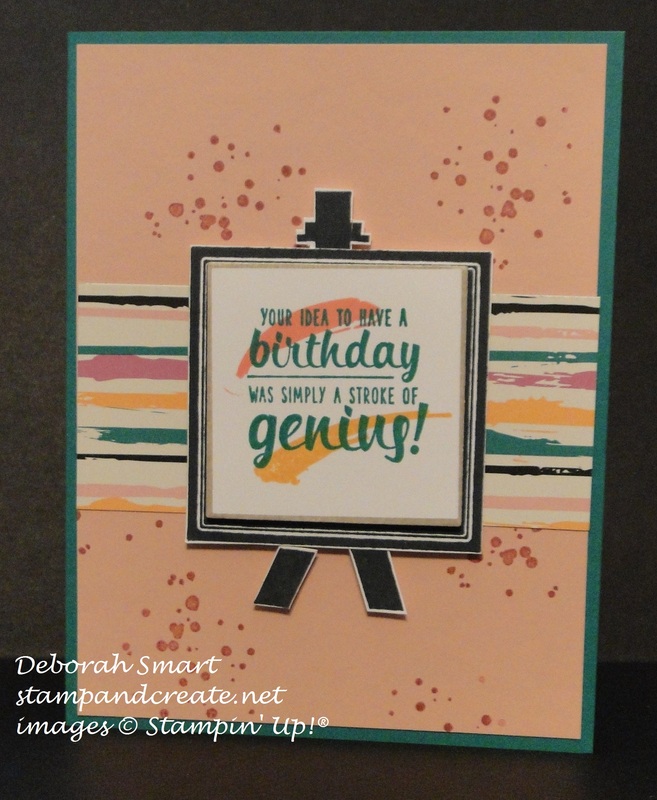 But your first card made me mouth “oh” when I saw it–perfect sponging and collection of colors to highlight the beautiful silhouette stamp–a very pretty card! Thanks for sharing your creativity with us! Thanks, Marsha! I’m looking forward to making shaker cards with the new Painter’s Palette set – I bought the new long strips of double sided adhesive, just for that! Glad you enjoyed my projects; thanks so much for your comments.